This is a collection of recorded interviews that document the development of traditional square and related dance activity in southeastern Kentucky. The interviews were with mostly elderly residents of Harlan, Letcher, and Leslie Counties and were recorded by Peter Rogers in 1975. At the moment (July 2016) the audio files and transcriptions are not available online, but the SDHP is including these items to aid researchers interested in source materials for further study. 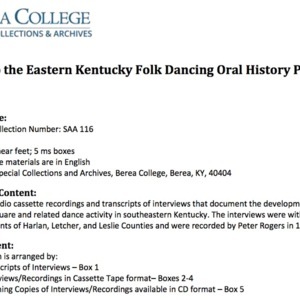 Peter Rogers, “Eastern Kentucky Folk Dancing Oral History Project,” Square Dance History Project, accessed April 26, 2019, http://squaredancehistory.org/items/show/1588.